In a private demo yesterday, Google showed us a prototype of JBL's upcoming Link Bar - a high-end sound bar with Android TV and Google Home capabilities baked right in. While they weren't sharing details like the amount of storage it comes with or the chipset it uses (or even if it supports 4K60, though we got the sense it does), they did demo an Android TV feature we'd never seen before. You see, one of the drawbacks of Android TV has been its inability to provide a "native" control experience for your TV. You can't tell the Google Assistant to switch inputs or adjust the volume if you're not on the Android TV output. With the JBL Link Bar, that's all about to change: Android TV is gaining active overlay support, and this JBL is the first such product to have it. 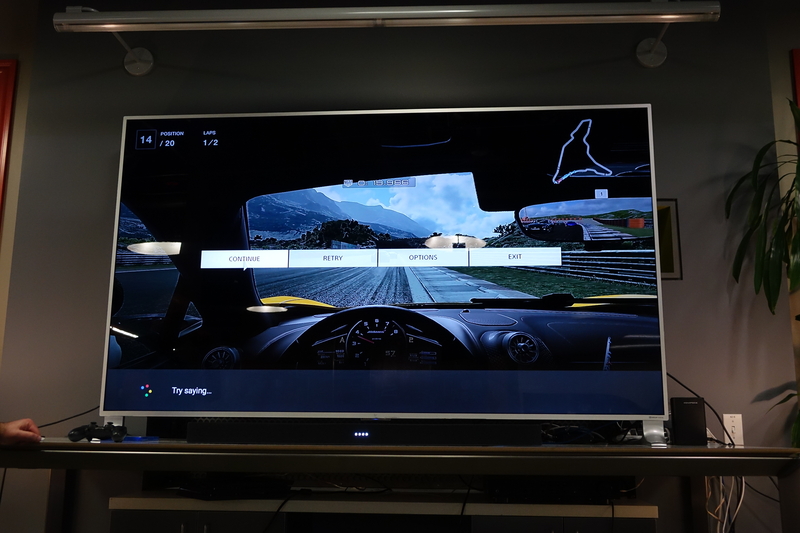 In the image above, you can see the Assistant overlay displaying while the sound bar is displaying input from a PlayStation 4. You'll be able to summon the Google Assistant on any of the JBL's three HDMI inputs and use it to switch between or do just about anything else the Assistant can on your TV. You'll be able to provide custom names for your inputs (e.g., "switch to DirecTV"), but Android TV will also be able to detect their public device names over the HDMI connection. This is a huge boost in functionality for the Assistant experience, because it brings Android TV's powerful voice control to all of your connected devices. We didn't get a great photo of it in action (it's a very early build, and it's buggy), and Google wasn't speaking as to what all the Assistant would eventually be able to do in terms of controls. Given that HDMI CEC is pretty universally supported these days, though, you can imagine what an active crossover version of Assistant could be capable of eventually - things like turning your stereo receiver on, changing channels, and more. Given this JBL sound bar is also a full-on Google Home, this is easily the most powerful and capable Assistant device to be announced. Google says we can expect more devices in the "over the top" (OTT) space this year, and that JBL's is just the first imagined form factor. Let's hope active crossover becomes standard fare for Android TV hardware going forward, as it makes the platform as a whole that much more appealing.